What are the habits of highly successful people? I am quite certain that successful people have a lot of discipline – whatever they choose to practice. As a young man in boarding school, and later as a monk, I learned the value of discipline. I doubt I would have ever achieved academic success without the discipline of planning my day and attending to the most important stuff early in the morning. –Ernest Hemingway: Up at 5:30 every morning to write even if he’d been drinking the night before. He wrote as a practice, not just when he felt inspired. –Benjamin Franklin: Sat naked every morning in fresh air for his “bath” which he swore fuelled his energy and creativity. He also listed 13 character traits he wanted to build and measured how he lived against each of them every night before he slept (in a journal). –Padmasree Warrior (Chief Technology Officer at Cisco Systems): Regular “digital detoxes” where she unplugs from technology to reboot her brain and replenish her creative reserves. –Leonardo da Vinci: Slept via small naps throughout the day versus sleeping 8 hours straight. The famed inventor Thomas Edison reportedly did the same thing (as does Hip-Hop mogul Sean “P. Diddy” Combs). –Peter Ilyich Tchaikovsky: Daily walks which shifted his mindset from the mundane to the original. The Great Nelson Mandela used to walk entire days for the exercise and mind-clearing effects the discipline would deliver. So many extreme achievers take a walk every day; ideally take your walk in nature. And bring a means to capture the outpouring of fresh insights that will flow. –Steve Jobs: Would fast for extended periods of time, recognizing that it created a sense of euphoria within him that motivated his dazzling output of ideas. He also loved carrots, eating so many during one period that his skin turned to a soft orange color. –Maya Angelou: Writes in a cheap and spartan hotel room she rents. She awakens at home around 5:30 each morning, has coffee with her husband and then shows up at the hotel room to do seriously productive work by 7 am. “It’s lonely and it’s marvellous,” she says. Personally, I’ve done the most important work of my career in hotel rooms from Buenos Aires to Auckland. And on airplanes (the longer the flight the more I get done). –Ludwig Van Beethoven: Loved his coffee and measured out his beans with meticulous love and care: 60 beans per cup. Many elite performers use this drink as a productivity tool. But please do so in moderation: Balzac drank 50 cups a day. Sadly, he died from a heart attack at 51. –Mick Jagger: Exercises 6 days a week and includes ballet, pilates and yoga in his regimen. Sir Mick clearly gets that fitness rewires the brain to fight fear, reduces the stress response and multiplies stamina. –Stephen King: Writes every single day of the year and does not get up from the pursuit of his craft until his daily quota of two thousand words has been met. Please also remember that: The quality of your habits defines the caliber of your performance. GAY – Is it really something to be proud of? It’s gay pride and I find myself asking the question some might ask: “What’s there to be proud of?” It’s not like I graduated with high honors from gay school or won an event at the gay Olympics. I also couldn’t be bothered to go to any kind of a parade. I also don’t give a frig what anyone thinks of me – yes really, I don’t care what you think about me. But I wasn’t always like this. So I had to do a bit of an archeological dig into my past to try and understand why I should celebrate gay pride. Well, when I was about 20, I knew that the “phase” thing was a bit of a joke. Living in Dublin, I had found a bookshop across from the entrance to Trinity College that had gay books and a magazine called Gay Times. I distinctly remember the absolute terror I’d have walking up to that section of the bookstore and wondering if anyone would see me. I never bought any of the “gay” books or magazines. If anyone came close to me, I’d just shift over to the next section and suddenly pick up a book about history. This small act of going to this bookstore was like an emotional rollercoaster: the fear, trepidation and shaky legs when walking up to the gay section and the fleeting feeling of relief – knowing that there were other gays out there. Over a period of about 18 months, I think, I began to realize that there was absolutely nothing wrong with me. That in fact, the real issue was simply with how people might perceive me. First, my studies in social psychology taught me about in-group and out-group psychology. It turned out that one of my professors – a good Jesuit, Fr. Micheal McGreil – was an expert on prejudice. I began to see that people’s attitudes are the real problem. Further studies in social theory (especially Michel Foucault and Hegel) helped me make a huge personal leap into realizing that I wasn’t deviant and that such a label was arbitrary. I was also a religious brother at this time and it was clear to me that if I was “made in the image and likeness of God” – then good ole God is kinda gay too!! By 1989 I had come out to a few friends, to my two brothers and I then left the monastery – I was 24. I still had to work for a living and, teaching in a highly regarded, all-boys Catholic school, I had to be extra careful. What would happen if some of the teachers (or worse, the students) found out? 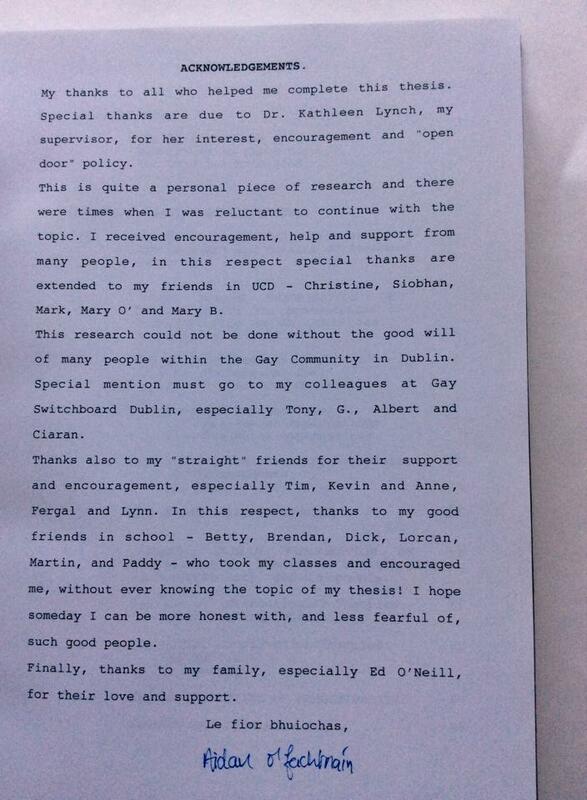 It was, on the one hand, a very liberating time – I was part of the gay community in Dublin, volunteered for Gay Switchboard, helped a Saturday evening group of men coming out of the closet (thank you Tony – I will never forget how much you made me laugh and how comfortable you made us all feel) – that side of life was great. My weekends involved coaching rugby or attending rugby matches on a Saturday morning and off to my big gay life in the afternoon. AND when Monday morning swung around, questions in the staffroom (“What did you get up to for the weekend?”) were extremely difficult to answer. I told lies and it gnaws at your soul to have to tell lies. It took me a full two years before I told another teacher that I was gay. I was terrified that it would impact my efforts to be made a “permanent” (tenured) teacher – at this time, homosexuality was illegal in Ireland. I only disclosed to my good friend Brendan Byrne after I was made permanent. 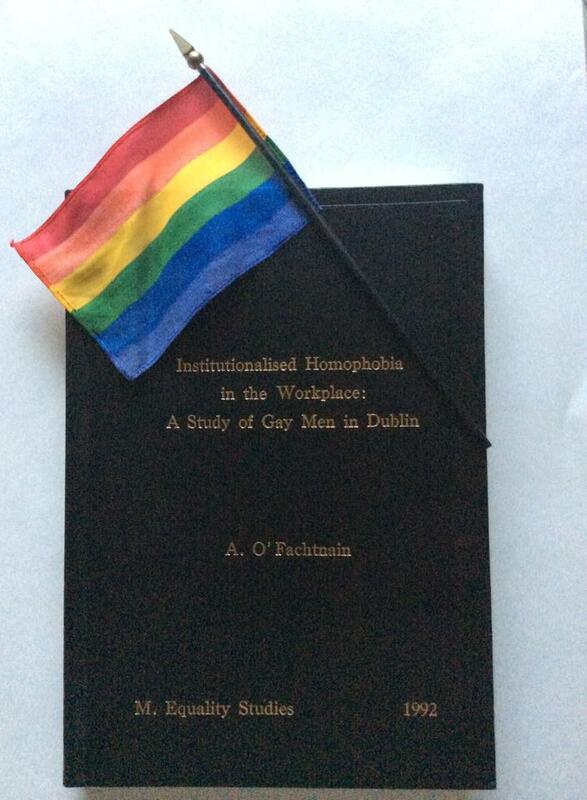 I knew I wasn’t the only one in this position at work and, for my master’s degree at UCD, I wrote about homophobia in the workplace. At that time, there wasn’t a single other academic study of homosexuality in Ireland that I could reference (homosexuality remained illegal in Ireland until 1993). I survey sampled my friends at Gay Switchboard – 40 out of 50 returned the questionnaire. You’ll notice that I submitted my thesis using a Gaelic version of my name. For my troubles, this piece of work earned first class honors. The desire to live unfettered and free from other people’s prejudice would lead me to leave Ireland in 1993 and move to San Francisco. I attended my first pride parade that year and I balled crying at the endless parade of gay people of every shape, size and color AND a huge number of straight people who turned out in support. So if you are still reading…I am going to answer the question: what am I proud of? – I am proud of my self-acceptance and desire to live free from anyone else’s attitude toward me or thoughts about me. – I am proud to be a part of a community of people that doesn’t let what other people think of them define what they do or accomplish in life. – I am proud that I have a great relationship with a man I love that has been sealed by marriage (in Canada). – I’m proud that we now live in a world where gay children can grow up with a lot less fear than I did. I’m proud that those children can say: “Look at Damien, he’s gay and he has a happy, fulfilled life.” When I was growing up, I had no such role models. And here’s the rub: it doesn’t matter if you are straight or gay; when we truly “grow up” we live lives that are self-directed and where we can demonstrate self-reliance. We never let other people dictate who we can be or limit what we can accomplish. Perhaps just growing up is something to be proud of – some of us just have a few more obstacles on that path. P.S. My legal first name is Aidan. We had an unexpected start to our vacation in Rwanda. I was so happy to be on vacation and have a 30-hour journey behind us…then we decided to go to the Genocide Memorial in Kigali (the capital city of Rwanda). We were both moved to tears. The memorial is quite beautiful considering that there are over 250,000 people buried in this single mass burial site (they are still burying human remains). In a nutshell, Belgian colonists historically reinforced tribal differences between the dominant Hutus and the minority Tutsis. Using tactics common to all acts of genocide, the Hutus used propaganda to demonize Tutsis. It is suggested that the military had planned the genocide for a long time and used the shooting down of the President’s plane as the catalyst for the horrific events of 1994. In the space of 6 weeks, neighbor turned against neighbor. The killings were most brutal – 800,000 people perished and 250,000 were displaced. The world stood by and did nothing. In this Catholic country, the Tutsis took refuge in churches only to have their Hutu priests murder them. When I asked why there are no dogs in Rwanda, I was told that during the genocide the dogs learned to eat human flesh and had to be euthanized en masse. Great way to start a vacation, eh? Yet out of this incomprehensible tragedy, the Rwandan people have emerged united and strong in their commitment to “oneness” and forgiveness. It has taken me almost 50 years to realize that seeing others as not the same as us or lesser than us is indeed an act of violence against our own nature – we are all in this together or we all fail. Fresh flowers commemorating 20 years. Burials continue at this site. Between 257,000 and 258,000 people are buried here. A tale of two Thanksgivings.